We are not sure what is with the flowing cash. John Horgan sat there in the audience when the video below was being made in witness of this day. John Ridsdale wanted to do this the Wet’suwet’en way, starting with a smoke feast, well they did enter somewhat of an agreement, 2 million dollars’ worth, that’s only the Office of Wet’suwet’en’s portion of the spending spree. The public pays the other half or more as well. There is however a question in regards to the legality of any binding agreement they might conjure up between them. Consider the following, on one hand we have the Office of Wet’suwet’en representing 2 out of 5 reserves also known as band offices. 100% of the people on the negotiating team are from only 2 of the reserves. They admit in front of Horgan at the smoke feast, the absence of the other 3 reserves. 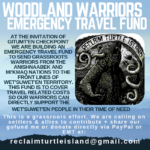 The province of British Columbia is negotiating separately with those 3 reserves who are claiming under the banner of the Carrier Sekani Tribal Council, it in itself is a legally binding organization representing the Wet’suwet’en people. All of those represented by the Carrier Sekani Tribal Council are members of the 5 houses also covered by the Office of Wet’suwet’en with one notable difference, they do not recognize the Office of Wet’suwet’en as their representative to government, they do not recognize the chiefs of the 5 clans as their chiefs. Starting at the 3:54 min mark, some very sobering words. This speech nails it, the problem, the best and most accurate speech of the day. We have possibly 3 illegal chiefs, who were appointed by the Wet’suwet’en Five on one side of a possible legal battle for those positions and control of the lands involved, and the other side is the chiefs who were legitimate hereditary chiefs prior to the issue of CGL and LNG. How could the goverment in all fair conscience give land to one organization while the other must suffer at the hands of a system they do not recognize. In a false play for reconciliation, Horgan has dishonored his obligations to the Carrier Sekani Tribal Council. Instead of working with them it now appears he has been frightened over the issue of CGL to work against them, even though they are in support of CGL. This is buying votes with tax dollars, the same thing Horgan accused Liberals of. So it could come down to the need for a court case to determine if the Wet’suwet’en Five had the right to strip hereditary chiefs of their power, as the three chiefs stand by thier responsibility and authority to this day. So it begs the question of signing a settlement of land claims ownership, when the signatures on those very important deal may not even hold validity. How can you sign to what you have not proven is yours? Is not the onus on the Hereditary chiefs to prove they are legitimately in their position? 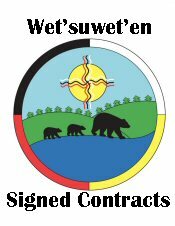 There is no legal judgment already in place that allows the Office of the Wet’suwet’en to be the sole signature on the lands of the Wet’suwet’en people. None of the chiefs that went to court are alive today, so legitimacy must be proven before a signature is valid. There is no less validity in a deal stuck with the Office of the Wet’suwet’en as there is with a deal struck with the Wet’suwet’en Matrilineal Coalition. Both are run by equally valid hereditary chiefs. The government of BC and the Government of Canada need to decide on only one legal body representing the Wet’suwet’en people, and it cannot do so with a group that keeps moving the goal posts in regards to Wet’suwet’en law. This will lead to more pain and money, costs down the road if the wrong people are signatures. Three of five communities are not subject to the laws of the Wet’suwet’en Five’s definition of Wet’suwet’en law. There is only one option for both Canada and British Columbia, and that is to obey the will of the Wet’suwet’en people via a democratically made decision under a democratically elected leadership. This entry was posted in Aboriginal Issues, Bulkley Valley, Coastal GasLink, Editorial, LNG. Bookmark the permalink.